Does the rainy British weather have you dreaming of a luxury beach holiday? 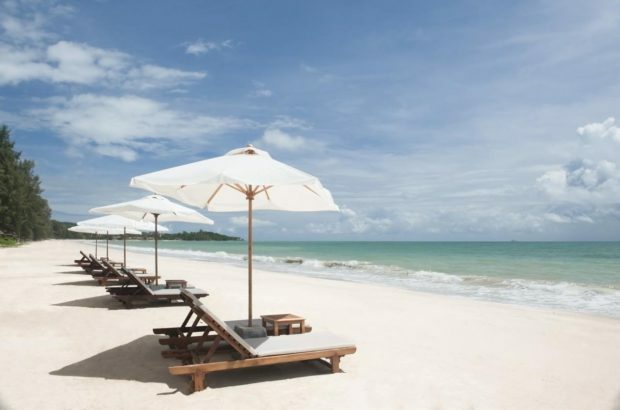 Imagine spending long days sunbathing on secluded, pristine beaches with your favourite book in hand. Or, stroll along the sandy shores with your special someone. For many, a luxury beach holiday is a perfect escape. Whether you travel to far-flung destinations like Thailand or stay closer to home, there are many worthy beach holiday destinations. Our guide features some of the best beach holiday destinations as well as a super helpful list of things to do when you’ve had enough of sunbathing and fabulous must-stay hotels. Keep reading to find out more. Fringed by spectacular, towering limestone cliffs, Krabi is one exotic beach holiday destination. On Mainland Krabi, you’ll find long stretches of gorgeous white-sand beaches, luxury resorts and plenty of opportunities to dive beneath or into the waves. Krabi is also the jumping off point for the nearby Thai islands of Koh Phi Phi and Koh Hong, simply catch a water taxi and seize your next adventure. Whether you’re here simply to lie on the beach or are looking to get a bit more active, Krabi has something for everyone. Railay Beach. Only accessible by boat and surrounded by high karst mountains, Railay Beach is one of Krabi’s, and perhaps the world’s, most spectacular beaches. Spend your days lounging on white-sand beaches and watching daredevil rock climbers take on the limestone cliffs. If you’re feeling more active, you can explore the karst rising out of the bay with a kayak. Koh Poda. A short day trip from Ao Nang, Koh Poda offers travellers a different pace of life from Krabi’s more popular and busy beaches. You can explore the tiny coastal island by longtail boat or kick back and unwind on one of the many pristine, white sand beaches. There is also great snorkelling and swimming here too. Krabi Hot Springs. After you’ve spent a relaxing day at the beach, head to Klong Thom district where you’ll find Krabi’s natural hot springs. A long hot soak in these warm mineral-rich waters will rejuvenate your skin and leave you totally refreshed. Afterwards, take a cool dip in the nearby river to cool off — the perfect end to a beach day. Nakamanda Resort & Spa. With stunning views of Khao Phanom Bencha and direct access to Klong Muang Beach, this five-star resort is a fantastic choice. Guests can take advantage of the outdoor pool or if you’re feeling more active, the fully equipped fitness centre. There’s also an on-site spa offering rejuvenating beauty treatments and Thai massages. Layana Resort & Spa. Welcome to an all adult paradise. Children aren’t allowed here so you can truly relax and look forward to a quiet stay. This five-star resort overlooks a white-sandy beach and turquoise waters. It also has an outdoor infinity pool, on-site fitness centre, well-stocked library, on-site restaurant serving Thai and international dishes and private gardens. There’s also an award-winning spa which provides pampering services and soothing facial treatments. Rayavadee. 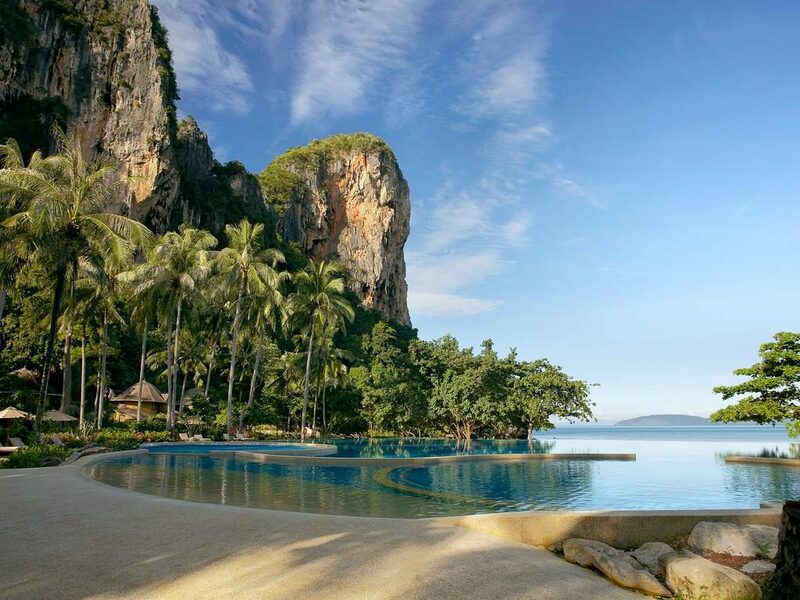 Located on the beautiful Railay Beach, this luxurious, five-star accommodation is a fantastic option. Guests can take advantage of an outdoor swimming pool, on-site full-service spa and fitness centre, and numerous dining choices. If you’re looking to completely relax in one of the world’s most beautiful settings, Rayavadee is the ideal choice. Krabi has consistent weather year-round with temperatures varying from the mid-twenties, in the colder months, to the early thirties in July and August. January is one of the driest months so is a great time to visit for a beach holiday. More rain is typically expected from May onwards with September and October receiving the most rainfall. Also known by its Italian name Zante, Zakynthos is known across the world for its long sandy beaches, azure blue sparkling waters and breathtaking scenery. 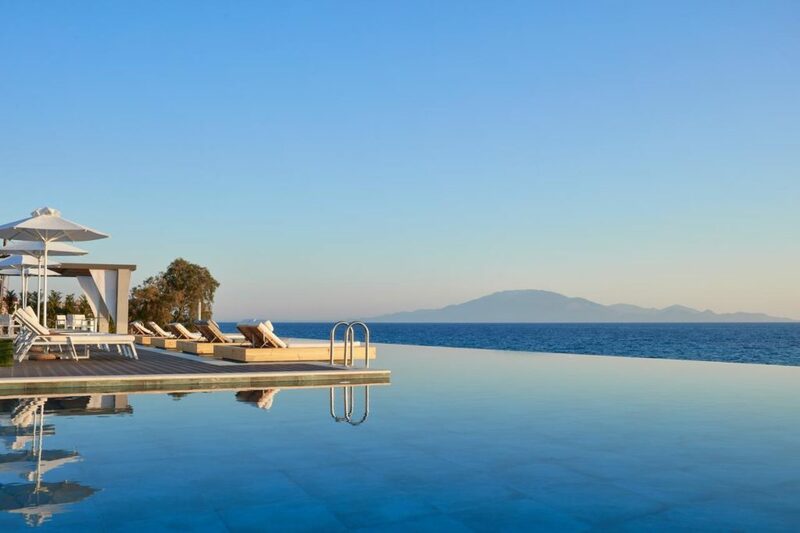 You can spend your days reading and soaking up the Greek sunshine or venture further afield to explore the secluded beaches along the islands’ spectacularly beautiful rugged west coast. Whatever you choose, you’ll be hard pressed to find a better beach holiday destination. Life, on Zakynthos, centres around its shimmering blue waters and sandy beaches. If you’ve had too much sun, there’s also a castle, water parks and rural villages. But, Zakynthos’ real drawcard are the beaches. Navagio Beach. Also known as Shipwreck Beach or Smugglers Cove, Navagio is one of Zakynthos’ best beaches. There’s actually a rusted smuggler’s hulk on the shores, which adds an interesting touch to this otherwise pristine, gorgeous beach. Navagio is a bit off the beaten track so you’ll need to take a boat to get here. Zakynthos Marine Park. Covering an expansive part of the island the marine park features miles of sandy beaches including Imni Keri and Kalamaki, two offshore islands and a diverse ecosystem. Keep your eyes peeled for loggerhead sea turtles, bottlenose dolphins and Mediterranean seals. Laganas Beach. Stretching for over six miles, the golden sands of Laganas Beach are an island favourite. Spend your days lazing on sun loungers as you work on your tan or take a refreshing dip in the calm, blue azure waters. Laganas is particularly popular with families with young children as it has shallow waters that gently slope into the sea. Zakynthos has many fantastic adult-only resorts so you can relax without the noise of kids. Many of the resorts are all-inclusive with on-site restaurants, spas, fitness centres and outdoor pools. Some even have access to private beaches, so you don’t need to fight over the last sun-lounger. Lesante Blu. Escape to your own private paradise at this five-star exclusive beach resort. It’s the ideal choice for a luxury beach holiday as you’ll have access to a guest-only, private beach so you can enjoy the Greek sunshine and Zakynthos beauty without the crowds. There’s also a very cool infinity pool, three restaurants, and an on-site spa. Zante Maris Suites. Another adult-only option, this swanky five-star hotel has swim-up suites, so you can walk out your front door and take a refreshing dip in an infinity pool. Some suites have access to a private pool and most have sea views. There’s also an on-site restaurant and fitness centre. Olea All Suite Hotel. Located an 11-minute walk from Tsilivi Beach, this five-star hotel features an outdoor infinity pool, fully-equipped fitness centre with yoga and exercise classes, spa with steam room and sauna, and three fantastic on-site restaurants. With so much on offer, you’ll really be able to unwind and relax. Summers in Zakynthos brings highs of 33 degrees Celsius and plenty of sunshine. The good weather also attracts many visitors with peak season running from June to August. If you’re looking for a quieter beach holiday, we suggest visiting outside these times. The shoulder season of April to May or September to October are fantastic times to visit as the island is quieter, but the weather is still good. If you’re looking to retreat in a tropical paradise, the Florida Keys are an excellent choice. The Florida Keys are an archipelago covering over one thousand islands, all boasting gorgeous white sand beaches. You can spend your days lounging by turquoise and azure waters, sampling local seafood or even exploring the world’s third largest barrier reef. Most holidaymakers base themselves in Key West, known for its charming pastel-coloured old town, fantastic restaurants, art galleries and a thriving nightlife. Scuba Diving. With the world’s third largest coral barrier reef off the coast, scuba diving and snorkelling are popular options. The Great Florida Reef has more than 400 species of tropical fish including dolphins, eagle rays, reef sharks, turtles and manatees. Bahia Honda State Park. Located in the lower Florida Keys, Bahia State Park has some of the region’s best beaches. Beaches have long stretches of soft white sand fringed with palm trees and azure waters. Key Largo Hammock Botanical State Park. For a more active day, head to Key Largo Hammock Botanical State Park, a nature reserve protecting more than 80 critical species of plants and animals and boasting over 60 miles of hiking trails. You might even spot an endangered American crocodile. The Florida Keys has some excellent four and five-star luxury resorts. Most resorts have direct, if not private, beach access and a range of facilities including spa and wellness centres. With so much on offer, you may never need to leave your hotel. Playa Largo Resort & Spa. This four-star resort is located on 14.5 private bayfront acres. Guests can enjoy the outdoor pool, private cabanas, hot tub, fire pits and water sports facilities. There’s also two onsite restaurants, a rum bar, and exclusive spa and fitness centre. You can even book an ensuite massage for ultimate privacy. Margaritaville Key West Resort & Marina. Located in Key West’s old town, Margaritaville is the place to stay if you’re looking for a good time. This four-star, waterfront hotel has an outdoor heated pool, hot tub, fitness centre, onsite boutiques and water sports facilities. There’s also an onsite restaurant serving American cuisine and a pool bar for poolside drinks and snacks. Casa Marina Beach & Resort Club Waldorf Astoria. 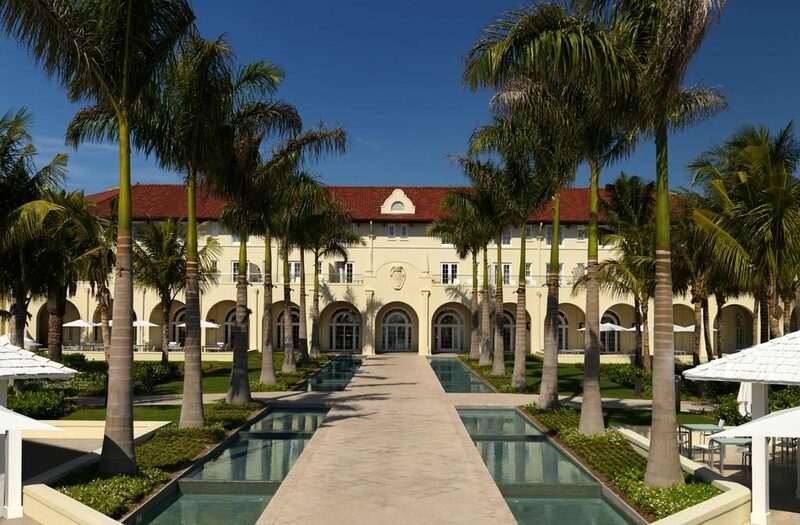 As one of Key West’s five-star resorts, the Waldorf Astoria offers some of the best luxury facilities. It has a private beach and is set within a historical 1920s resort. Onsite, you’ll also find a spa offering oceanside massages and two seaside pools. Guests can also sign-up for water sports activities or dine at the two onsite restaurants and rum bar. The Florida Keys are a great luxury beach holiday destination at any time of year. Temperatures remain relatively consistent with the coldest months having temperatures of 25 degrees Celsius and the warmest bring lows 30s. There’s plenty of sunshine year-round too. Throughout the year, you’ll also find a number of fantastic festivals like Key West Food & Wine Festival in January or Key West Pride in June.